The concept of the public sphere, as first outlined by German philosopher Jurgen Habermas, refers to the right of all citizens to engage in debate on public issues on equal terms. 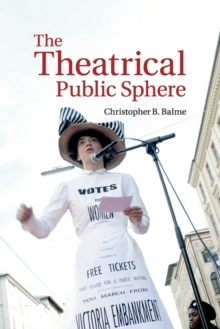 In this book, Christopher B. Balme explores theatre's role in this crucial political and social function. He traces its origins and argues that the theatrical public sphere invariably focuses attention on theatre as an institution between the shifting borders of the private and public, reasoned debate and agonistic intervention. Chapters explore this concept in a variety of contexts, including the debates that led to the closure of British theatres in 1642, theatre's use of media, controversies surrounding race, religion and blasphemy, and theatre's place in a new age of globalised aesthetics. Balme concludes by addressing the relationship of theatre today with the public sphere and whether theatre's transformation into an art form has made it increasingly irrelevant for contemporary society.